Seriously, how great was this opening sequence? 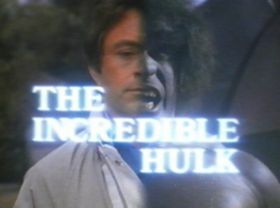 Someone on You Tube uploaded a bunch of clips where David Banner hulks out for really lame reasons. They're hilarious. In this one, he hates traffic, just like the rest of us. In this one, a blonde girl decks him. In this one, he's pissed off at a pay phone. I DON'T HAVE TWENTY-FIVE CENTS!!! HULK SMAAAASH! Oh, and in this one, he fights a bear, and the green paint on Lou Ferrigno comes off on the bear's fur! Now this next clip isn't from the TV series, but I had to share it, because holy cats, can there be a worse cartoon theme song than this one? If David Banner saw this, he would totally transform out of sheer embarrassment.